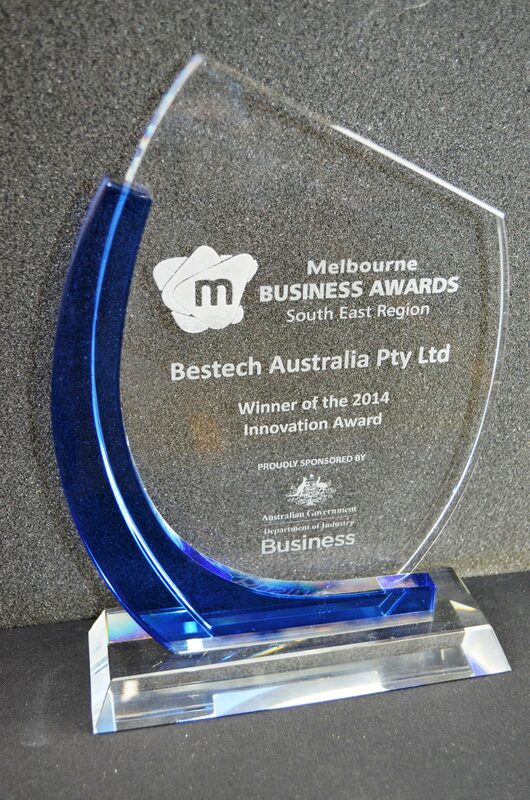 Melbourne, VIC – Dec 5, 2014 – Bestech Australia has been named the winner of the 2014 Innovation Award in Melbourne Business Award-South East Region, the only business awards program judged by the committee members and sponsored by Australia Government Department of Industry. The Melbourne Business Awards are about enthusiasm, initiative and innovation not just applying rigid performance benchmarks. Successful business demonstrating innovation in their field of expertise, classed as industrial, manufacturing or engineering located in South East metro region are the criteria to meet. Bestech Australia has been nominated by the City of Kingston Council in 2014. Melbourne Business Awards 2014 honors were presented in only 2 categories, including Business of the Year and Most Innovative Company of the Year. Nominations for the “Business of the Year” Award are open from each year from January to August. From all nominations eight Award Nominees Finalists are chosen via committee selection process. At each of the Breakfasts throughout the year, two of these Award Finalists present to the audience and broadly outline the secrets behind their success. During the final Gala Breakfast at the end of the Year the “Business of the Year” Award Winner and “Innovation Award Winner” are announced.